A lovely soft hanging hand towel for your home. This towel can be used either in the kitchen to hang on the oven door or in the bathroom as a great guest towel. It would also make a lovely hostess or house warming gift. The bottom towel section is made from quality cotton terry towel. 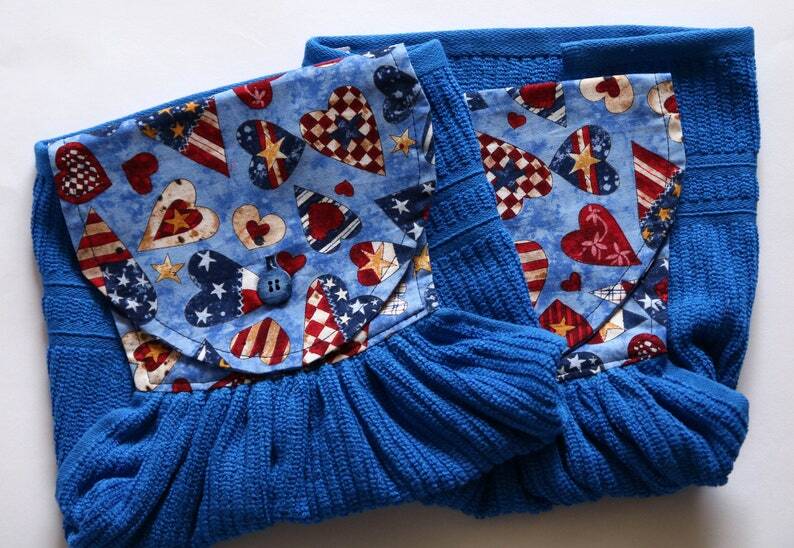 The top is cotton fabric and has an American Patchwork theme and there is also a row of top stitching for effect and strength. There is a matching button for closure. This great looking hand towel is available and ready to ship. CARE INSTRUCTIONS: Cold Machine Wash on Gentle Cycle. No Bleach or Fabric Softener. Line Dry/Tumble Dry Low.